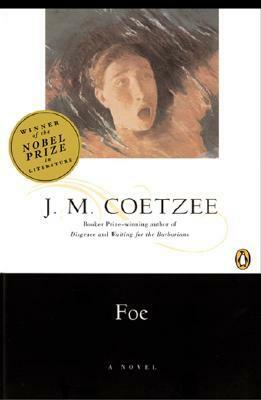 In Foe, Coetzee retells the story of Crusoe’s island, with one change: what if it wasn’t just Crusoe and Friday on the island? Susan Barton gets washed up onto Crusoe’s island after she is shipwrecked, and once she, Crusoe, and Friday are rescued, she sets forth in the task of setting down the truth about the island, and about Crusoe. Before starting this book, I strongly recommend you read Robinson Crusoe, because while I’m not a huge fan of De Foe’s novel, a lot of important distinctions are made within Coetzee’s version of the story that make the story itself more interesting and more insightful. (But also knowing where the story comes from and all the peculiarities is definitely going to be more helpful when reading Coetzee’s novel). There were a few things I liked about this book, and a few things I had trouble with. The first–and main thing–that was slightly problematic for me was the fact that the book itself, while it is engaging once you start reading it, is really hard to pick up. When I first started reading it, I was determined to finish it, but every time I looked at the book sitting on my bed-side table or sitting there in my backpack, I would think, “Eh. Not feeling it.” That having been said, once I opened the book I would lose track of time, and get fairly involved in it. The other thing that bothered me, and I’m not going to go too much into this, was Susan’s relationship with Crusoe, and how she identifies herself with Friday. As the book went on, the relationship with Friday became easier to read, but the relationship with Crusoe continued to be a little gross to me. I did love the inclusion of a woman to the story of Crusoe, especially since it allows for this nice commentary on the way people thought of women in the society, and the inclusion of female authors into the literary canon. Most of the novel consists of letters written by Susan (our main protagonist) to Foe, and in much of the novel she is actually writing the story of the island and of Crusoe. And yet most of the book consists of her repeatedly saying that she cannot become an author. I should also mention that what made this book truly enjoyable was the fact that I read it as an accomplice to literary theory, and so when I was reading it, I was more focused on what the book was saying about different aspects of literature and society, rather than simply reading the book. I think that if I had read it by itself, I might not have enjoyed it as much, but that is hard to say for sure.